A travel advice service is warning holidaymakers about the dangers of hiring quad bikes this summer after a man suffered a fractured skull and lost his sight on one eye in an accident. The Association of British Travel Agents is urging people to remember that Quad bikes are not always covered by travel insurance. More and more holidaymakers are hiring quad bikes as a means to get around, often on main roads and in resorts. ABTA has warned that without any training, road experience or proper protection this could be extremely dangerous. In Greece alone there have been five incidents involving holidaymakers and quad bikes since June. 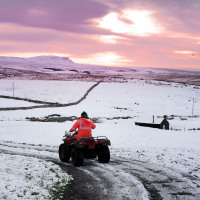 The advice service say it is be better to book quad bikes through tour operators as they offer the opportunity for customers to book organised off-road bike excursions through reputable agencies, which "follow appropriate health and safety guidelines and include safety briefings". Three in 10 people do not make sure their insurance covers them for activities before participating in them. This means that in the case of an accident, holidaymakers could be liable for medical costs - which can add up - especially if they require the use of an air ambulance to get them back to the UK. "One snap decision completely transformed my life"
Melanie Simmonds was seriously hurt after a quad bike crash in Greece. It took over a year for her to recover from her injuries. The 32-year-old advised holidaymakers to be aware that quad bikes are "heavy and dangerous". She said: One snap decision completely transformed my life. I could have lost the use of my legs or worse, my life." Melanie believes that her injuries could have been far worse if she had not been wearing her camera on her back as it helped soften the impact of her crash. She added that she was not covered by her insurance as she had not planned to use a quad bike before her trip. She said: "Value your life and your safety because accidents can happen to anyone and your life can change in an instant."